It is the report of the scriptures that the Father and the Son look alike. Paul assures us that Christ is “the brightness of [his Father’s] glory, and the express image of his person” (Hebrews 1:3, emphasis added). We also have from Joseph Smith in the Wentworth Letter a corroborating testimony. “I was enwrapped in a heavenly vision,” Joseph said, “and saw two glorious personages, who exactly resembled each other in features and likeness” (Dahl & Cannon, Encyclopedia of Joseph Smith’s Teachings, p. 267). So we have established from credible sources that the Father and the Son look the same, but there must be more information for poor souls such as us to comprehend somewhat what their holy faces look like. And so there is! There is further testimony from Joseph Smith that gives many more details. “We saw the Lord standing upon the breastwork of the pulpit, before us,” Joseph related, “His eyes were as a flame of fire; the hair of his head was white like the pure snow; his countenance shone above the brightness of the sun; and his voice was as the sound of the rushing of great waters” (D&C 110:2-3). This corroborates with John the Revelator’s testimony of Christ, that “His head and his hairs were white like wool, as white as snow; and his eyes were as a flame of fire; And his feet like unto fine brass, as if they burned in a furnace” (Rev. 1:14-15). So that settles what color God’s hair is - white, which is not surprising since he is a resurrected being. The rest is ambiguous, though powerful, in its description. We shall attempt to interpret it. What does it mean to have “eyes…as a flame of fire”? Surely they would not be the color of fire (orange), but this description describes the piercing effect of such Eternal eyes. There are interesting and reliable testimonies that corroborate each other in the matter of God’s eye color. The first that shall be quoted is from a person, Alexander Neibaur, to whom Joseph Smith personally related the story of his First Vision. According to Neibaur, Joseph “saw a fire toward heaven come near and nearer; saw a personage in the fire, light complexion, blue eyes, a piece of white cloth drawn over his shoulders [and] his right arm bare” (Dahl & Cannon, Encyclopedia of Joseph Smith’s Teachings, p. 269, spelling modified). From this testimony of John Murdock we find some very revealing facts: 1) Alexander Neibaur’s account of Joseph’s vision is corroborated both in the fact of the eye color (blue) and the skin complexion (white/light). 2) It is the penetrating aspect of God’s eyes and countenance that led both Joseph Smith and John the Revelator to exclaim that his gaze was “as a flame of fire.” 3) The locks in God’s hair contain curls. 4) John Murdock perceived the hair color of God to be “silver grey,” a slight variation from “white like pure snow” (D&C 110:3) and “white like wool, as white as snow” (Rev. 1:14). It is possible that that is how it seemed only from his perspective, or that God can change the appearance of his hair color as occasion seems appropriate, or “bright silver grey” is simply another way to describe the brilliance of God’s hair color. [God the Father] was surrounded as with a flame of fire, which was so brilliant that I could not discover anything else but his person. I saw his hands, his legs, his feet, his eyes, nose, mouth, head and body in the shape and form of a perfect man. . . . This appearance was so grand and overwhelming that it seemed I should melt down in his presence, and the sensation was so powerful that it thrilled through my whole system and I felt it in the marrow of my bones. (Zebedee Coltrin as quoted in Karl Ricks Anderson, Joseph Smith’s Kirtland: Eyewitness Accounts, p. 110). Now there is the matter of a beard. Does God have a beard? We may assume so, since Isaiah testified of Christ, “I gave my back to the smiters, and my cheeks to them that plucked off the hair” (Isaiah 50:6; 2 Ne. 7:6, emphasis added). Also, in the preexistence, Christ would have looked the same, since he told the Brother of Jared, “this body which ye now behold, is the body of my spirit…and even as I appear unto thee to be in the spirit will I appear unto my people in the flesh” (Ether 3:16, emphasis added). If the Lord had a beard in the preexistence, and also as a mortal, we may assume he also has one presently as a resurrected being. In fact, we know further from the Book of Mormon that Christ looked the same in his premortal, mortal, and immortal resurrected state, as that record assures us: "Jesus showed himself unto this man [the Brother of Jared] in the [premortal] spirit, even after the manner and in the likeness of the same body even as he showed himself unto the Nephites [i.e. as a resurrected Being]" (Ether 3:17). Though we have not personally seen God, now we have a vision of what he looks like: bearded, beautiful curly or wavy white hair, blue eyes as penetrating as eternity, beautiful fair skin, and a countenance conveying overwhelming love. This is the likeness of the Man the world prays to and whom we call our Father in Heaven. 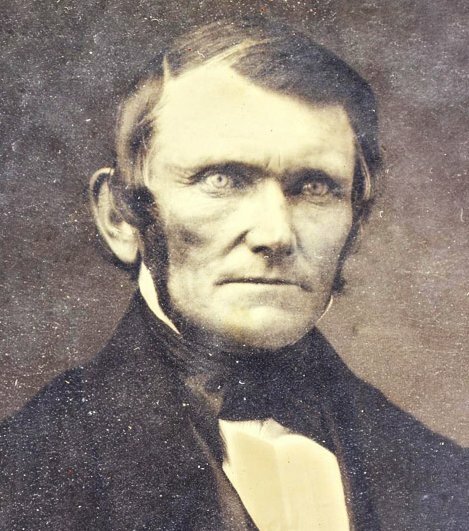 A Picture of Wilford Woodruff at age 43. Wilford had very penetrating blue or grey eyes that were startling to behold. Perhaps this is somewhat like what was meant by Joseph Smith, John Murdock, and others who saw the Lord - the penetrating blue eyes of God, which are like "as a flame of fire" (D&C 110:3; Rev. 1:14).